Knights and lions and trains, oh my – what’s better for a little boy? Thanks to Sara for suggesting Lionel as Baby Name of the Day. Lionel traces his roots to the Greek leon – lion. The king of the jungle has inspired parents for centuries. 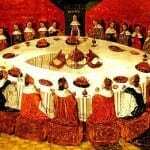 There were popes called Leo, the revolutionary Leon Trotsky, and Sir Lionel, a Knight of the Round Table in Arthurian legend. Lionel probably evolved as a French diminutive – Leon plus -el, hence the meaning “little lion” you’ll find in many guides. The first famous Lionel was the younger son of the King of Gaul and cousin to Lancelot. He’s almost certainly a fiction, but like any Arthurian knight, there’s something romantically appealing about his name. 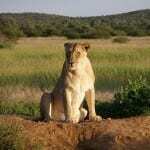 Plenty of aristocratic Lionels can be found over the centuries. King Edward III of England gave the name to his third son, the future Duke of Clarence, in the 1300s. Three hundred years later, Lionel Boyle was the 3rd Earl of Orrery, and a Member of Parliament from Ireland. A string of Lionels can be found in between, too. American royalty also embraced the name. Oscar-winning Lionel Barrymore was part of the acting dynasty. In more recent generations, Lionel has seemed more workaday. Lionel Cartwright scored several hit singles on the Billboard country music charts in the 1980s. On television, George and Louise Jefferson were parents to Lionel; the character moved from neighborhoods with his parents from All in the Family to The Jeffersons. And then there are the trains. Before there was Thomas the Tank Engine, kids grew up playing with Lionel model trains. Founded by Joshua Lionel Cowen, the company produced trains from 1903 until 1969, and recently re-entered the business. Cowen wasn’t the first to put train tracks under Christmas trees – the practice started in Germany – but they’ve become an American tradition. It lends Lionel a certain vintage charm. With Leo all the rage, you might expect Lionel to making a comeback, too. But so far, the tide that has lifted Leonardo and Leon has left him out. Never a smash hit in the US, Lionel appeared in the Top 1000 most years from 1880 through 1998. But he’s been fading for years. Blame it on Lionel Richie. While our kids may know him mainly as grandpa to Harlow and Sparrow, today’s parents probably hear Lionel and think easy listening. Spanish variant Leonel does chart in the US Top 1000 and might be an option for parents who love Lionel’s three-syllable rhythm, but would rather not hear the lyrics to “Dancin’ on the Ceiling” and “Hello” sung as lullabyes. But the pop singer is fading, while Leo is widly fashionable, and boys’ names ending in -el are catching on, too. If Gabriel and Raphael, Abel and Dashiell, can join the evergreen Michael and Daniel in use, then why not Lionel? I just saw the movie The King’s Speech. I wonder if it will improve Lionel’s popularity at all? I think that Lionel Hutz, the dodgy lawyer from the programme The Simpsons, would be one of the first associations for many twenty-somethings today who grew up watching the show. Honestly, I like it. It’s nerdy and spunky at once. Not dated at all. I’ve heard of a few little ones named Linus, and this is just a step away. I’ve never really thought about Lionel before, but, now that you have have brought it to my attention, I think I like it. I get this strong dual nerdy and skeevy vibe. That and images of a much older man with an entire container of Brylcreem through his hair, trying in vain to maintain his unruly comb over. hmm I should thiknk Lionel Ritche…but Im a geek and all I think is Lionel Luthor. I prefer Leonel (pronounced lee-, not lye-). I agree that Messi will probably make this name more popular. I like Lionel and while it makes me think of Lionel Richie (and is that really a bad thing) it also makes me think of the jazz great Lionel Hampton. As a (relatively new) Kentuckian, I think of Lionel Hampton just after Lionel Richie. Funny, a lot of people have that reaction. I don’t have any negative associations with Lionel – surprising how that works sometimes. It also makes me think of the PBS kids show ‘Between the Lions’. One of the lions is Lionel – I’m looking it up and I guess he’s one of the child lions, so that gives it a younger feel. The -nel ending doesn’t really do it for me either. Maybe it sounds somewhat feminine to me. I prefer Leo. Another famous wearer of the name that may boost popularity is Argentina’s soccer superstar Lionel Messi. You’d think Lionel Messi would have had a bigger impact on the popularity of this name, but maybe it has in Spanish speaking countries. Totally missed Messi. But you’re right, C & Veronica, I’m sure that could be an influence. And his pronunciation is appealing. I’m in my mid-20s, so for me the Lionel Ritchie association kind of kills the name like Abby said. It’s not a bad association, it’s just the only one and it’s quite strong. A side note – I know a late 50ish Pakistani-American man named Asadullah, which translates from Arabic as ‘Lion of God’. Talk about a strong, masculine name! I have no idea how popular the name is in Pakistan or if people use Asad by itself, but to my knowledge it’s not common in Arab countries.